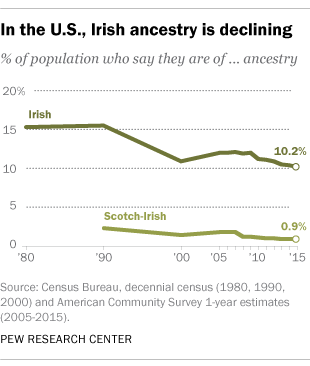 On this St. Patrick’s Day, here’s news that might dampen the party: The ranks of Americans who trace their ancestry back to Ireland – long one of the most prominent subgroups in American society – are slowly declining. In 2015, 32.7 million Americans, or one-in-ten, identified themselves as being of Irish ancestry, making it the second-largest ancestry group in the U.S. after Germans. In addition, nearly 3 million Americans claimed Scotch-Irish ancestry, or just under 1% of the entire population. (The Scotch-Irish were mainly Ulster Protestants who migrated to the British colonies in the decades before independence, while Irish Catholics didn’t begin arriving in large numbers until the 1840s.) By comparison, the Republic of Ireland and Northern Ireland have a combined population of about 6.6 million. The ranks of both Irish and Scotch-Irish Americans have fallen a lot in the past two-and-a-half decades, and the trend does not appear likely to reverse. Two decades ago, in 1990, 38.7 million Americans (15.6% of the total population) claimed Irish ancestry, and 5.6 million (2.3%) identified as Scotch-Irish. Both ancestral groups are older than the U.S. population as a whole. In 2013, the median age of those claiming Irish ancestry was 40.5, and 52.1 for those of Scotch-Irish ancestry, versus a median age of 37.8 for the entire population. Nor are the Irish immigrating to the U.S. in anything close to the numbers they used to: In fiscal 2015, according to Department of Homeland Security statistics, just 1,607 Irish-born people obtained legal permanent residency. Irish and Scotch-Irish Americans are most highly concentrated in a few areas of the country, reflecting their historical migration patterns. The poor Irish immigrants who fled their famine-stricken homeland in the 1840s and 1850s generally settled in or close to the Northeastern port cities where they first arrived. New England states continue to have the highest share of residents claiming Irish ancestry: Massachusetts (21.6%), New Hampshire (21.0%), Rhode Island (18.3%), Vermont (17.9%) and Maine (17.6%). The Scotch-Irish, who arrived earlier than the Irish in the early 1700s, moved to the more mountainous interior of what were then Britain’s American colonies. To this day, the states with the highest share of residents claiming Scotch-Irish ancestry are North Carolina (2.6%), South Carolina (2.4%), Tennessee (2.2%) and West Virginia (2.0%). The Census Bureau has asked Americans to identify their ethnic ancestry since 1980, and annually since 2005. Because they can pick one or two, we counted everyone who chose Irish or Scotch-Irish as their primary or secondary ancestry. We used one-year estimates for nationwide Irish and Scotch-Irish populations, and 2011-2015 five-year estimates for state-level populations. Note: This is an update of a post originally published March 17, 2015. It has been updated to include newer data.